A diwan or Turkish Diwan is a couch like furniture used as a sofa during the day and a bed by night. It’s more like a box-spring based bed which can serve the purpose of a single bed. Used since the Turkish reign, these side-sofas or smaller sized beds have always brought a touch of royalty to the house. They are exquisitely designed to be spacious and be of much utility as possible. They come in two parts which are: the wooden frame which is the base also used a large storage box. And the 2nd part is the mattress and is used as the leisure one. They fit together with no over-longs, as two love-birds. These have always been quintessential for smaller spaces. Always handy for an extra-guest to rest his head for the night! They are as useful as they are handy. 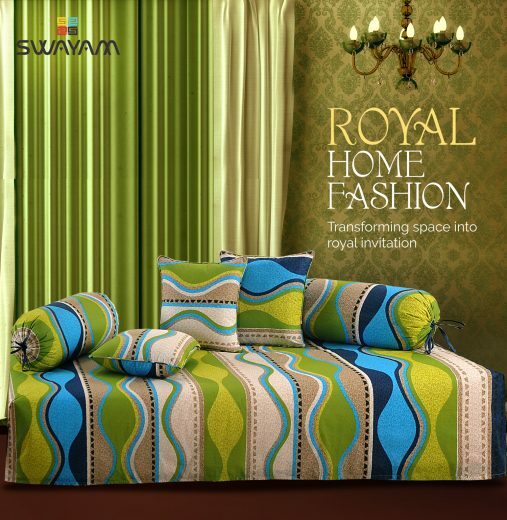 Swayam India provides the regal touch to the royal divans of the house. Beautifully designed bed sheets set and diwan sets available online for a fresh outlook. Today, shopping for Diwan sets online is an easy task as doing cardio. Being an important part of the home-furnishings, diwan sets can’t be just covered with a plain sheet. These have to be discreetly designed with bolster pillows, throw pillows or cushion covers. Today, a diwan is given the same respect as the couches or luxurious sofas of the house. The bed sheets and diwan sets available by Swayam are so beautifully designed that once you lay eyes on them, you may want to just pick more than one. Intricately designed in pure cotton with a 210 thread-count makes them an exquisite item to pick. Pre-tested for color-bleeding and shrinkage, these come with a guarantee to stay. The whole set for the elegant diwans consist of a bed sheet, cushion covers and bolster covers for your discretion. Easy to wash without spending on expensive detergents. Swayam urges you to buy these splendid diwan sets online over their shopping portal. These come in subtle yet exoteric range: Linea Diwan Set, Diwan-e-khaas, Shades of Paradise Diwan Set, Caramel Diwan Collection, Zinnia Diwan Collection and Veda Diwan Collection. So don’t waste a single minute thinking or re-thinking about ordering them and streamline them proudly.